Little ones will have hours of fun riding with George. 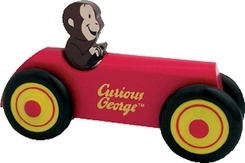 This bright red wooden car features rubber wheels and Curious George is in the drivers seat. Ages 3+.